Close up detail of the piece in progress. I didn’t know in advance what form or materials I’d use for each artwork and the idea was to let the island experience inform each piece. Also, rather than creating the artworks in the order I visited them – I went with which island was speaking to me most loudly to be unleashed creatively. The first turned out to be Bardsey Island which I spent a week on last August. I found it a fascinating and spiritual island and although it wasn’t one of my favourites of the 14 I visited, there was something about it that got under my skin. Bardsey is a difficult island to reach due to the fierce currents that swirl around it and was touch and go if we’d even get there. My Partner, Richard, joined me on this trip and we opted to stay at the Bardsey Bird Observatory. One of the things I discovered as part of this project was that anyone is welcome to stay at Bird Observatories and being a bird expert isn’t a prerequisite. This was great news as I knew a few birds but am no expert. The idea to create an artwork that combined elements of Bardsey and Illuminated Medieval Manuscripts came about as a result of the Islands layers of history and its importance to pilgrims. 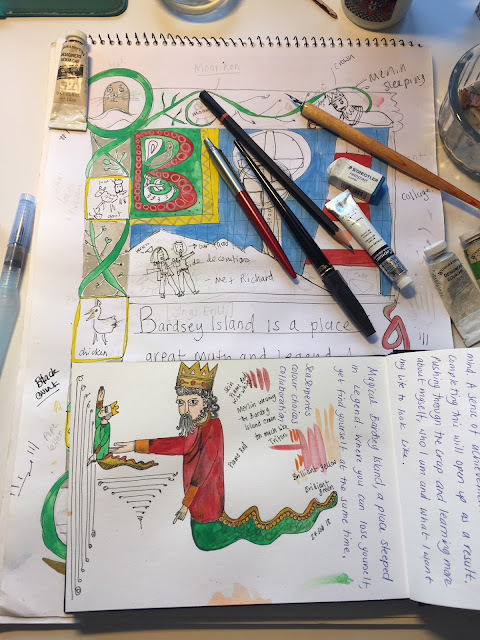 I wanted to create a modern version so researched illuminated manuscripts and the kinds of materials used. First test version on fabric. Richard looks more like Shaun Ryder from the Happy Mondays than, well, Richard! 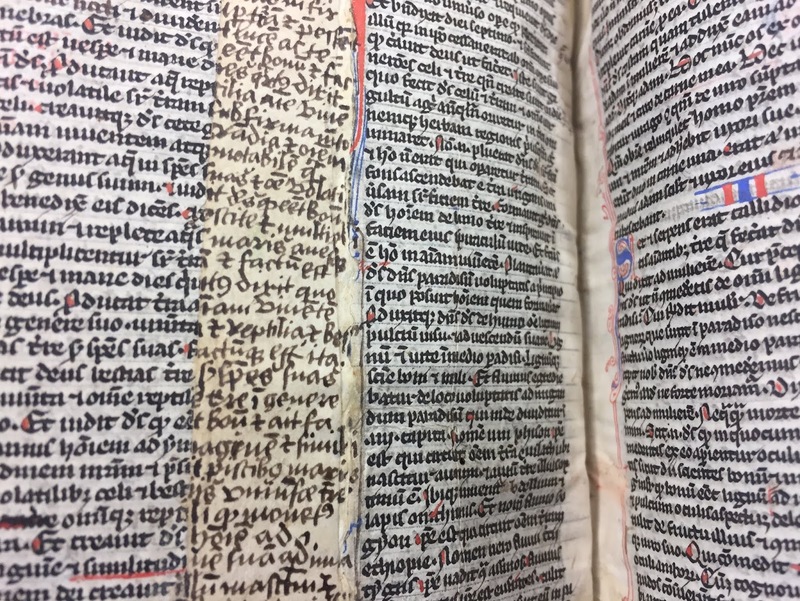 This quest led me to the British Library and then closer to home – Downside Abbey as I discovered they have a large collection of Illuminated manuscripts and it’s actually only a short drive from the Arts Charity I work for part-time. Seeing examples up close made me realise that they weren’t at all perfect and that I’d been trying (and failing) to create something that I just couldn’t with my current skills. I’d never tried calligraphy before and its an art unto itself that requires years of practice. 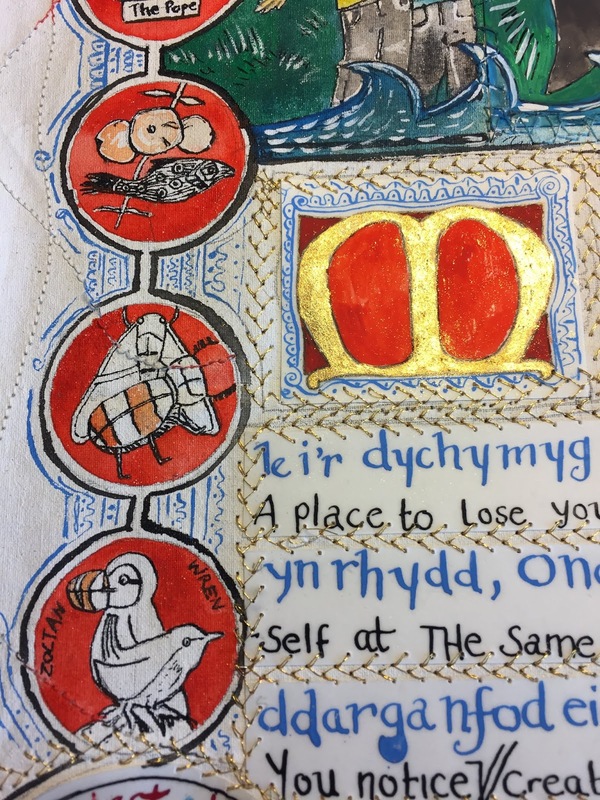 It was totally OK that all my animals seemed to appear with their own character as most of the animals in original illuminated manuscripts bare little or no resemblance to the actual animals they are trying to represent. Once I’d accepted all this it really took some of the self-imposed pressure off and freed me up to continue to experiment and to finally complete this first piece. It took me waaaaay longer to complete this artwork than I'd expected. Originally I'd given myself a month, but in the end its taken nearly five. And you know what? That's totally OK. 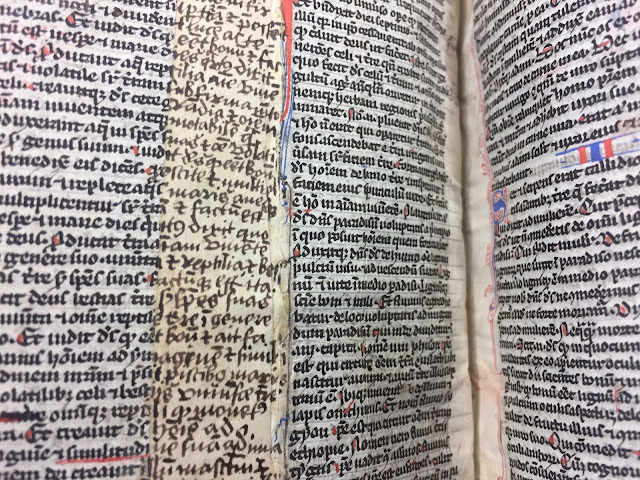 The cost of vellum was so expensive that books would be mended. As each book was handmade can you imagine how long that would take to complete one? 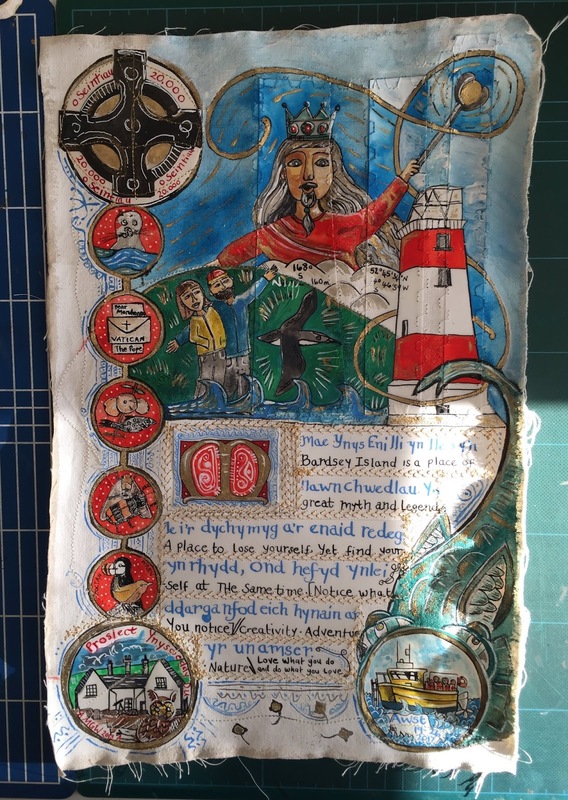 I experimented with materials and used a mix of fabric, gesso, vellum - which I stitched with gold tread into the fabric, gouache, inks and photographs. It became a much more textural piece in the end. I wasn’t trying to create an exact replica, I was trying to create something that had a feeling of Bardsey island and of my visit there. Something that told a story. After working through the ‘its not good enough and being frustrated with my efforts’ thoughts I was actually really pleased with the final result. Now I need to work out how to mount or frame it. 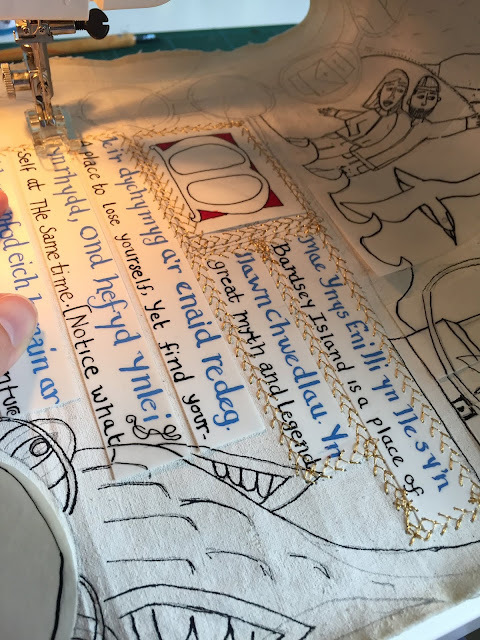 The vellum being stitched into place with some gold tread I already had. Were possible I tried to use materials I already had at home (minus the vellum mind you. That came from William Cowley). In addition to actually visiting the island I loved the research and discovering the amazing resource of Downside Abbey on my doorstep, trying materials I’ve never used before and the feeling of satisfaction once it was completed. Ahhhh! 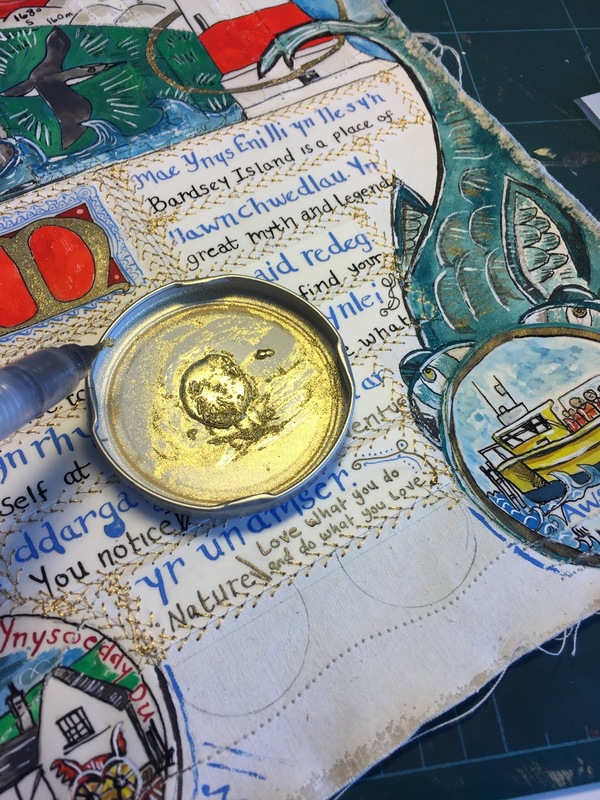 The Yellow Boat of Hope and the Sea Monster: We are taken across the water in a bright yellow boat skippered by Colin Evans. It was a really rough crossing which made me think of the sea monsters often depicted on old maps. As I was painting in its details I realised that this monster also represents mental health as I struggled a bit physically and mentally on this particular island adventure. I think everyone could benefit from a Yellow Boat of Hope. Bardsey Bird Observatory where we stayed. We had a really warm welcome and learnt so much about the island and its wildlife by staying here. The owl in this piece is a bit funkier than the one we actually saw, and if you look at illuminated manuscripts often the animals and birds look nothing like real-life as they’d have been drawn from the monk’s imagination. So, I let myself of the hook! Zoltan the Skomer Puffin & Wren. I was given a sponsored Skomer Puffin and the soft toy that came in the pack I named Zoltan on account of his ring number. Zoltan joined me on the island visits. The wren is the talisman I took with me in the form of a necklace. For each Creative Adventure I have a different talisman that is linked in some way. I chose the wren as some islands have their own wren subspecies and it also represents my mum, who died of cancer when I was 14. The moth and beetle – just some of the insects we saw. Each morning we had the opportunity to join the opening of the Month trap [some large tubs filled with egg boxes] to study what had crawled in to the trap the night before. Everything is released and logged in a note book. The Bardsey Apple and a Brenda Chamberlain Fish. There is an apple tree that only grows on Bardsey, but apparently its not actually very nice. Brenda Chamberlain, A welsh artist, lived on Bardsey for 15 years [1947 – 1962]. Bardsey is a very creative island and is home to the poet Christine Evans and the Willow and Wool Weaver Jo Porter. There is also an annual Artist Residency Programme run through The Bardsey Island Trust and the Artist there when I visited was Carole Shearman, I did a wonderful workshop with her. Seals absolutely surround Bardsey and you can see them quite close to the shore. They'll either be lounging on rocks or bobbing about in the sea. I discovered that, if not treated, you can actually die from being bitten by a seal as their mouths are so full of harmful bacteria. Yikes! After learning that I didn’t get too close to them. The huge cross represents the 20,000 saints believed to be buried on Bardsey. Islands were seen by the Celts and Celtic Saints as portals to the other-world and so often coming to Bardsey [or any other island] would be for the sole purpose of it being their final resting place. Some days the island was so misty you couldn’t see your hand in front of you, making a walk to this cross next to the Abbey ruins a rather eerie experience. Merlin/The King of Bardsey/The Spirit of the Island. 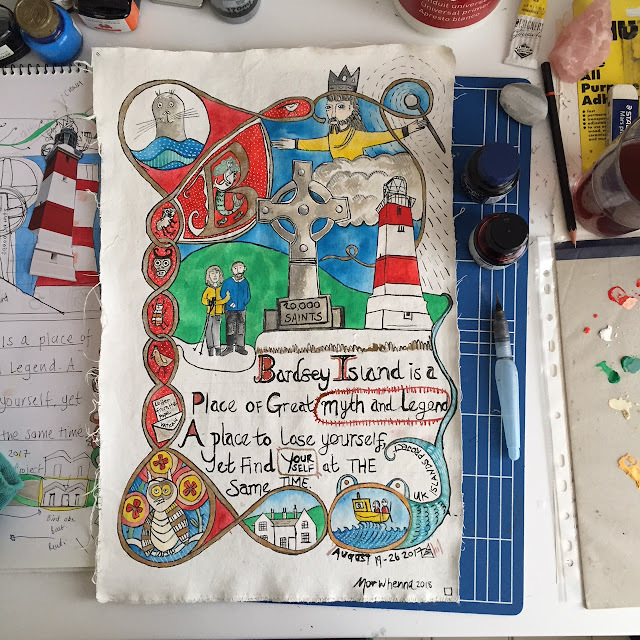 Legend tells of Merlin living in a cave on Bardsey and this island also used to have its own kings in the early 19th century. One was called King Love [How cool is that?] The Crown is now in the Maritime Museum in Liverpool. Pretty much every Island has a lighthouse and the Bardsey Island one is no exception. They have a smart square one. It became fully automated in 1987. I'm really keen to create something more 'messy' next as I discovered trying to be super neat and controlled was really hard work for me and I didn't take to it naturally!